The village of Arnea is already known from ancient times as (Arne or Avge). Remnants of the old town have been found on the hill of Prophet Ilias, 3 km northeast of the settlement, while today there is a significant archeological excavation in progress with important finds. In the late 15 th century a large settlement was established in the area, which was called Liarigovi or Liarigova (a name that was preserved up to 1928) and consisted one of the 12 communities that comprised the Mantemohoria (cast iron villages), during the pre-revolutionary period. Today, Arnea is one of the most important municipalities of Halkidiki and perhaps one the most picturesque villages in the area. Built at the foot of the luxuriant massif of Holomondas, it is surrounded by a beautiful and emotive landscape. It lies on the main road to Mt. 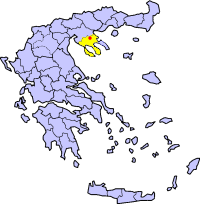 Athos , 70 km away from Thessaloniki and 38 km away from Polygyros, the capital of the prefecture. Its population is about 2500 people. Having preserved its traditional features and the natural environment unalterable until today, Arnea has been characterized by the Ministry of Culture as a "rich historical location". The traditional settlement, the manners and customs of the locals, the authentic produce (honey, yogurt, feta, textiles), the magnificent scenery as well as the hospitable people of Arnea, form a valuable reference point and a strong centre of attraction for its visitors. The guest has a variety of fascinating possibilities of coming in contact with the local folklore, the natural beauty and the simple, welcoming people. One can enjoy pleasant walks in the traditional area, with the old houses, the narrow paths and little alleys. They can learn about the history and culture of the area by visiting the folklore museum of Arnea , feel the religious devoutness in the old churches of St. Stephan and St. Anargyroi or in the exquisite, secluded chapels. Through a net of delightful sightseeing tours, picturesque paths and recreation areas, the visitor can approach and savour the unspoiled landscape and its un-polluted produce, as well as taste delicious homemade food. Besides they can enjoy themselves immensely. With Arnea as a starting point there are some particularly preferential options for daily trips. They can make a fascinating excursion-pilgrimage to Mt. Athos , visit the ancient Stageira (the birthplace of Aristotle), the Byzantine castle "Nepossi", which is very close, go swimming or fishing to the enchanting and spotless beaches of Halkidiki, or go hiking and climbing on the beautiful slopes of Holomontas inside the forest.